Why would you ever want to use your own CUSTOM handicapping parameters? Mainly because the USGA calculation procedure calls for a rolling average using the 10 lowest out of 20 scores, and you must have at least 5 scores just to calculate a USGA handicap. For clubs that play less than 20 weeks a year, it makes more sense to use a smaller rolling average to handicap golfers. Or maybe your organization does not meet the requirements to issue USGA handicaps. In that case you can set up a custom mode to emulate the USGA system. The calculated handicap would not be an official USGA handicap, but would be very close. Note: If you use the custom handicapping mode, no index (factor for RCGA) will be produced, only a handicap. An index by definition means you are using the USGA formulas to calculate handicaps. The Handicap Percent % figure is used to calculate the final handicap. How many scores will a golfer's handicap be based on? Determine how many scores you want a golfer's handicap to be based on. For example, if a golfer gave you his last 100 scores, how many would you use to base his handicap on? The maximum number of past scores HS will look at is 30. Enter this number in the box Number of scores handicap based on. Note: The more scores a handicap is based on, the less fluctuation you will see in handicaps. In other words, if a golfer’s handicap is based on 20 scores, any new score will have a 1 in 20 (5%) weight on his handicap. However, if his handicap was based on only 4 scores, any new score would have a 1 in 4 (25%) weight on his handicap. What is the minimum number of scores a golfer must have before a handicap can be calculated? Enter the number of scores a golfer must have before a handicap can be established. HS will not calculate a handicap until he\she has at least this many scores. What should HS do in every instance it may encounter? 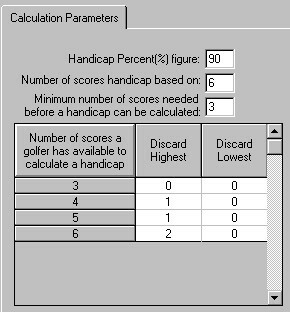 Drop any high or low scores when calculating a handicap? Fill in the handicap table to tell HS what to do in every instance it may encounter. What should HS do if a golfer has only one score to look at, only two scores to look at, only three scores to look at, etc. 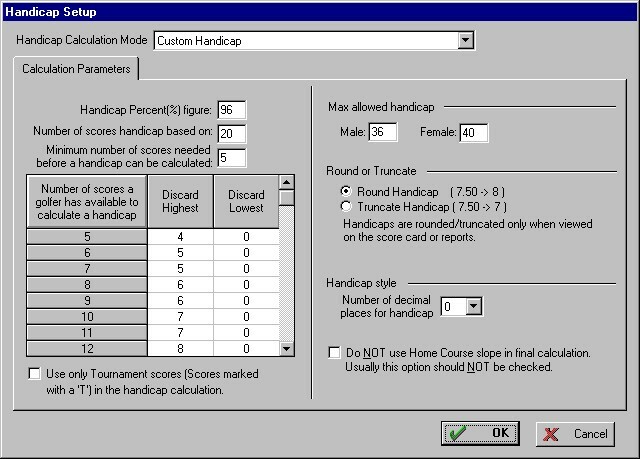 Do you want to drop any high or low scores when calculating a handicap? Note: Many clubs choose to drop some high scores, so that one bad score does not increase a handicap excessively. This helps deter sandbagging. If a golfer shoots an unusually high score, he may think it will make his handicap go up, but in reality it has no effect on his handicap since this high score will be discarded for handicap purposes. Number of scores handicap based on: 6 But when a golfer has 6 scores to base a handicap on do you want to drop any high or low scores before calculating a handicap? What if a golfer only has 5 prior scores to look at? Do you want HS to drop any high or low score then? What should HS do if a golfer has only 4,3,2, or 1 scores available? You must fill in the table to indicate exactly what you want the program to do in every instance it may encounter. If a golfer only has 5 scores, the best 4 of the 5 will be used. If a golfer only has 4 scores, the best 3 of the 4 will be used. If a golfer only has 3 scores, all 3 scores will be used. If a golfer only has 2 scores, no handicap will be calculated. If a golfer only has 1 score, no handicap will be calculated. The Parameters will be filled out as follows…. A golfer must have at least 3 scores before a handicap can be calculated. Specify the maximum handicap allowed in your league. The recommended USGA maximum handicap is 36 for men and 40 for women for 18 holes. If you are calculating nine hole handicaps, the recommended maximum is 18 for men and 20 for women. If you don’t have a maximum handicap, type in 99. How many decimal places do you wish to calculate a handicap to? Handicaps can be calculated to none, one, or two decimal places. If you mark this option, only tournament scores (scores entered with a T) are considered for handicapping. All other scores are ignored. Custom parameters work just the same, except only Tournament scores are considered. If this option is marked, handicaps will have a "T" posted beside them. The final handicap is usually determined by converting the custom handicap into a Final home course handicap. If you mark the option Do NOT use Home Course slope in final calculation this final formula is not used. John has 7 scores available. Only the last 6 scores are selected for consideration. The best 4 of these 6 differentials are used to determine the handicap. Assume 71.3 is the rating and 115 the slope for all scores. Home course is sloped at 115. Suppose you want to calculate a handicap by selecting 3 out of the last 5 scores. When you have 5 scores you want to drop the high and low scores and use the rest for handicapping. How would the CUSTOM HANDICAP parameters be set? The table above follows the exact USGA formula - 96% of the best 10 out of 20 scores. Please note that 20 scores are required to produce a full USGA handicap and at least 5 scores are required before an initial handicap is calculated. You can deviate slightly from the USGA and relax the minimum number of scores required from 5 to 1. This allows you to calculate the initial handicap with only one score. Remember—only the best score out the first 5 or 6 will be used for handicapping. The results will be that handicaps will move only down at first and then handicaps will slowly stabilize.